DETOX means to activate the natural self-purifying powers of the body. – that is our definition. Unbalanced and irregular eating, too much sugar, alcohol and nicotine, together with lack of exercise, damage our appearance and wellbeing. In addition, traces of environmental toxins and pollutants, which we absorb mostly without noticing, weigh down on our metabolism and often cannot be eliminated by the body alone. 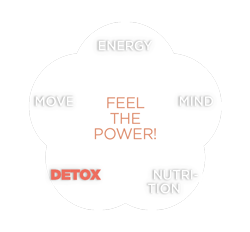 The Beck & Beck detox concept is a holistic approach to achieving a lasting improvement in the metabolic flows between the smallest units in the body – the cells. The central focus is optimizing the logistics of the cells, the transport of vital substances and cell respiration. The sustained benefits are based on improving well-being through improved cell energy. This approach also provides gentle and effective treatment methods for detoxification and firming up connective tissue, as well as strengthening and easing the burden on the classical detoxification organs such as the liver, intestine, kidney and skin. A further essential component is a natural diet, rich in vital substances, which stimulates the self-cleansing powers of the body and enhances vitality and life energy. For this purpose Beck & Beck have adopted, among other things, the principle of detoxification and fasting cures, bringing them up to date and optimizing their health effects. The result is a practical and effective detox approach which is light and enjoyable at the same time.